Does your organization have old computers, hard drives, printers, backup media, copiers & other IT equipment that needs to be discarded and disposed of in a secure manner? Whether you are responsible for managing the IT assets of a large corporate enterprise or a small business, our comprehensive programs will simplify the job of recycling your end-of-life technology assets. Our e-waste experts work to design custom recycling solutions that meet your unique requirements every time, including after-hours and weekends. TechnoCycle provides businesses in the greater Houston area as well as throughout Texas an effective and environmentally friendly e-waste re-use and recycling services. 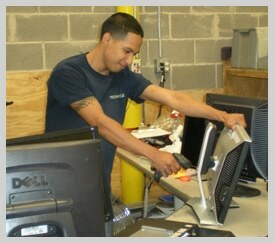 TechnoCycle is a full service IT Asset Disposition (ITAD) provider and electronic waste recycler. We provide creative technology solutions and services to businesses, organizations and corporations in order to simplify the disposal of your end-of-life technology. Our process is designed to mitigate the environmental impact of recycled electronics by following a secure “reuse and recycle” policy. Our goal is to ensure that data is properly erased and that all electronic materials we handle stay out of domestic and international landfills. All materials received at TechnoCycle are first considered for reuse before recycling. Manufacturing items takes a lot of energy and environmental resources, so reusing them beyond their planned obsolescence to their true functional end of life makes good environmental sense. Items that cannot be reused are recycled by breaking them down into commodities that are categorized in a controlled, secure workspace, and then sent to appropriate down-stream processors. These commodities are recycled and used to produce new products which help reduce the need for consuming additional environmental resources. 100% of the electronic materials we receive are either reused or recycled into commodities that will later be sent to a specialty processor. We ensure that materials are responsibly managed through our own in-house processing center or within our qualified nationwide partner facilities. Serial Number; and Asset Tag (if present). If you are looking for a electronic waste recycling partner in the greater Houston area, give us a call or fill in the form on this page to begin a conversation.